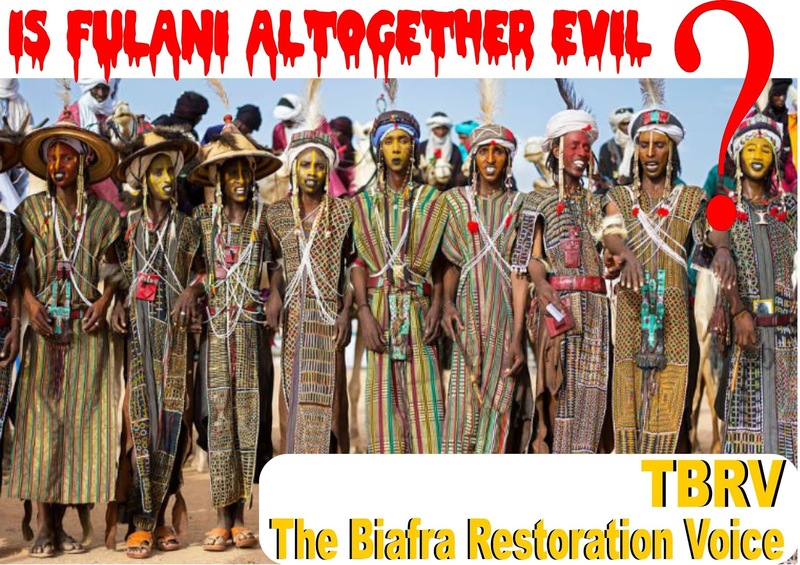 Home Biafra Featured Nigeria IS FULANI ALTOGETHER EVIL? This may not entirely be about Fulani or any sub groups within the Fulani. The predatory and parasitic Britain found out that the ruthless brutality and expansionist tendencies of the Fulani were suitable, compatible, and useful for their exploitative agenda. They therefore cashed in on this existing platform to manipulate and manoeuvre their evil creation called Nigeria, to make it appear as though the Fulani is in charge, while taking ORDERS from Britain. They had been executing this agenda even before the so-called amalgamation. In fact, this agenda was the motive behind the so-called amalgamation. If you observe all the machinations of the British since the so called amalgamation, including all the falsification of figures, all the blackmail and arm twisting, down to the genocide of 1967 to 1970 (which the evil Britain misled the world to regard as a civil war), and then further down to imposing Buhari of all people, on Nigeria, and insisting on maintaining the territorial integrity of Nigeria, for which there can never be any referendum in Nigeria, you can clearly see that the sadistic and predatory Britain is only using the Fulani, which they (Britain) has found very suitable as a cover for their atrocities. If not for the protective coverage granted to the Fulani by Britain, and the gullibility of the willing tools, coupled with the greed of the Afonjas, on what grounds will the minority Fulani, who are even recent emigrants to the Mohammedan emirates of the north, be lording themselves over the productive and progressive Indigenous people of Biafra, Oduduwa, and the rest of the nations entrapped in the British cage called Nigeria? As for Buhari, as someone reading this post now, tell yourself the truth. If Buhari were to come from Britain, after committing the treason of violently overthrowing a democratically elected government, would he not be condemned to spending the rest of his life in a pen, at best, or the gallows at the extremes? Has Britain not brokered or facilitated the likes of Buhari from other places spending the rest of their lives in jail? But in Nigeria, an Islamic extremist jihadist, treasonable felon, and a financial mismanagement suspect must be president. Why? To do Britain's dirty job of using the institutions of state to advance the Biafran genocide by Britain, which Britain suspended in 1970, after killing over 6 million Biafrans, (but have since resumed), so as to tighten their stranglehold on the Biafran wealth (OIL AND GAS), which presently constitutes about the MAINSTAY of the sinking British economy. Fulani is not different from other humans. The impunity of the present crop of Fulani is borne out of the fact that they are prodded by Britain, for the purpose of using them for their atrocities. That is why they have that false sense of docility, which they think is superiority or supremacy. And, unfortunately, the virus of that false sense of supremacy is infecting even their Hausa slaves, and other extended slaves, which has made them to relapse into dormancy, indolence, and docility, relying mostly, or even solely on the war booty that Biafra represents, for their sustenance. As we all know, as the days draw nearer for the Biafra referendum, every Biafran, home and abroad, must ensure that we do all we can to record a hundred percent success. No stone should be left unturned.